Carefree Prime-ZALL is a innovative 100% water-base epoxy universal primer created using breakthrough technology to offer unparalled stain blocking for use in both interior/exterior applications. This unique formulation provides superior performance when compared with traditional solvent-based primers. 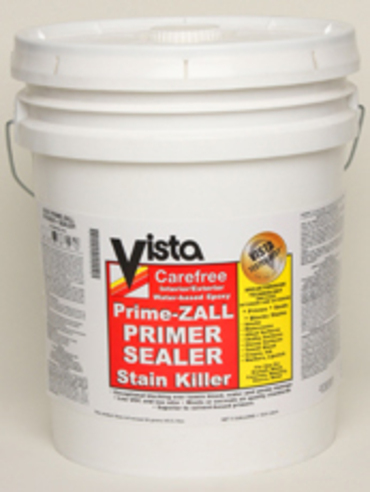 Carefree Prime-ZALL adheres to a variety of substrates including aged alkyds, is low odor & low VOC and meets or exceeds air quality standards. The quick-drying properties of Carefree Prime-ZALL allow a finish/top coat to be applied within 40 minutes after application of this primer. Carefree Prime-ZALL also provides superior enamel hold out for glossy top coats. NOTE: This product contains ingredients which resist the growth of microbes on the surface of the paint film. Recommended Uses: Interior/exterior woods including redwood & cedar. 1 Coat of Prime-ZALL will stop tannin bleed. It is a great sealer & stain blocker for use on interior stains such as smoke & water damage. Can also be used on new or previously painted drywall, stucco, galvanized metal or over aged alkyd surfaces. DO NOT mix with any other product, gelling will occur.